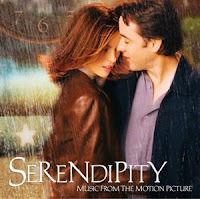 Have you seen the movie "Serendipity" starred by John Cusack and Kate Beckinsale? It was back in 2001. The story was about two strangers, Jonathan (John) and Sara (Kate) who met amidst of New York City and have felt an instant mutual feelings of attraction, problem is they were both in a committed relationship. Jonathan asks for her phone number; Sara suggests to have fate takes care of them. With a five dollar bill, Sara asked Jonathan to write his name and phone number on it while she write hers on the inside cover of a used copy of Love in the Time of Cholera and tells him that if they were really meant for each other, they will find their way back to each other in another's life. After that day, they never met again. Years went by...and the two were about to be married, both Jonathan and Sara still cannot forget their feelings of true love with each other! As two people who are meant to be united and after many misses, fate brings them back together before they get married to someone else.